Not to be confused with Cadillac de Ville series. For other uses, see seville (disambiguation). The Cadillac Seville is a luxury car manufactured by Cadillac between 1975-2004, as a smaller-sized, premium Cadillac. Despite its smaller size, the Seville typically carried the highest price tag among Cadillac's sedan models. It was replaced by the Cadillac STS in 2005. The name of "Cadillac's first small car" was selected over a revival of LaSalle and the GM design staff's preference, LaScala, primarily because, notes GM Marketing Director Gordon Horsburgh, "It had no negatives." The initial suggestion was in fact the name "Leland", honoring the make's founder, but it was rejected because most buyers wouldn't understand the reference and because Henry Leland had also founded Cadillac's rival, Lincoln. Hundreds of suggestions were considered,After painstaking research, LaSalle was the top pick, with St. Moritz a distant second, trailed farther behind by Seville (properly spelled now). A troubled past and difficult pronunciation, respectively, cleared the way for Seville's use. Seville is a Spanish province and the capital city of that province, renowned for its history and its treasures of art and architecture. The Spanish master painters Diego Velázquez and Bartolomé Esteban Murillo were from Seville. The Seville name first entered use by Cadillac as the designation for the two-door hardtop version of the 1956 Cadillac Eldorado. 1960 was the last model year for the Eldorado Seville. The Seville, introduced in May 1975 as an early 1976 model, was Cadillac's answer to the rising popularity of such European luxury imports as Mercedes-Benz and BMW. GM planners were becoming concerned that the division's once-vaunted image as "The standard of the world" was fading as the 1970s unfolded, especially among the younger generation of car buyers. Seeking to counter Cadillac's heavy slant towards the over-50 age group, the Seville was a bold attempt to both rejuvenate the make's image and win over young import buyers. Over time European luxury cars had become quite luxurious and even more expensive than the much larger Cadillacs. As the market share of these imports continued to climb, it became obvious that the traditional American automotive paradigm of "bigger equals better" had begun to falter. The Seville became the smallest and most expensive model in the lineup, turning Cadillac's traditional marketing and pricing strategy upside down. Full size design prototypes were created as early as winter of 1972–73 (wearing the tentative name "LaSalle", reviving the Cadillac junior brand from 1927–1940). Subsequent design prototypes looked more edgy (specifically a 1973 named LaScala which forwardly hinted at the 1992 Seville). Styling took strong cues from the Rolls-Royce Silver Shadow. Unibody construction included a bolt-on subframe, with a rear suspension based on the rear-wheel drive 1968–74 X-body platform that underpinned the Chevrolet Nova, including rear differential, with a thicker bushinged front subframe similar to the second generation F platform shared by the Camaro and Firebird and the 1975–79 GM X platform. Substantial re-engineering and upgrades from these humble origins earned it the unique designation "K-body" (rather than "X-special" following the format of the A-special Chevrolet Monte Carlo/Pontiac Grand Prix and B-special Buick Riviera). Also shared with the corporate X platform was part of the roof stamping and trunk floor pan (for 1973 and newer X platform vehicles). Cadillac stylists added a crisp, angular body that set the tone for GM styling for the next decade, along with a wide-track stance giving car a substantial, premium appearance. A wide chrome grille flanked by quadruple rectangular headlamps with narrow parking and signal lamps just below filled the header panel, while small wrap-around rectangular tail lamps placed at the outermost corners of the rear gave the appearance of a lower, leaner, and wider car. The wrap-around taillights might have come from a design sketch of a rejected Coupe DeVille concept. Seville engineers chose the X-body platform instead of the German Opel Diplomat in response to GM's budget restrictions—GM executives felt re-engineering an Opel would be more costly than the corporate X-car. Another proposal during the development of the Seville was a front-wheel drive layout similar to the Cadillac Eldorado. This proposal also met with budget concerns since the transaxle used for the Eldorado was produced on a limited basis solely for E-body (Eldorado/Toronado) production, alongside the GMC motorhome of the mid-1970s (which has a derivative of the E-platform drivetrain). Introduced in mid-1975 and billed as the new "internationally-sized" Cadillac, the Seville was almost 1,000 pounds (450 kg) lighter than the full-sized Deville. The Seville was thus more nimble and easier to park, as well as remaining attractive to customers with the full complement of Cadillac features. More expensive than every other Cadillac model (except the Series 75 Fleetwood factory limousines) at US$12,479, the Seville was modestly successful in the marketplace. It spawned several imitators including models like the Lincoln Versailles, and later the Chrysler LeBaron (Fifth Avenue after 1982). To ensure the quality of the initial production run of Sevilles, the first 2,000 units produced were identical in color (Georgian silver) and equipment. This enabled workers to "ramp up" to building different configurations. Total 1976 Seville production was 43,772 vehicles. Early Sevilles produced between April 1975 (a total of 16,355) to the close of the 1976 model year were the first Cadillacs to use the smaller GM wheel bolt pattern (5 lugs with a 4.75 in (121 mm) bolt circle; the 2003–2009 XLR also uses this pattern). The first Sevilles shared only a strict minority of components with the engineering starting point, the GM X-Body. The rear drums measured 11 in (280 mm) and were similar to the ones used with the Nova 9C1 (police option) and A-body (Chevelle, Cutlass, Regal, LeMans) intermediate station wagons. Starting with the 1977 model year, production Sevilles used the larger 5 lug — 5 inch bolt circle common to full-size Chevrolet passenger cars (1971–76), Cadillacs, Buicks, Oldsmobiles, Pontiacs, and 1/2 ton Chevrolet/GMC light trucks and vans. It also received rear disc brakes, a design which would surface a year later as an option on the F-body Pontiac Trans Am. 1975–76 models had a mandatory vinyl top due to the fact that the roof section was originally tooled up in two parts; the rear section around the C-pillar was pressed especially for Cadillac, and a regular X-body sedan roof pressing was used for the forward parts. Due to customer demand, a painted steel roof was offered beginning in 1977, which required a new full roof stamping. 1977 Seville production increased slightly to 45,060 vehicles. The following year, production increased to 56,985 cars and ended up being the peak production year for the first generation Seville. The engine was an Oldsmobile-sourced 350 cu in (5.7 L) V8, fitted with Bendix/Bosch electronically controlled fuel injection. This system gave the Seville smooth drivability and performance that was usually lacking in other domestic cars of this early emissions control era. Power output was 180 hp (130 kW), gas mileage was 17 MPG in the city and 23 MPG on the highway (the larger Deville and Fleetwood were still getting single digit gas mileage) and performance was good for the era zero to 60 mph (97 km/h) taking 11.5 seconds. A diesel 350 cu in (5.7 L) LF9 V8 was added in 1978, the first diesel engine offered in passenger vehicles in America. The Cadillac Trip Computer "Tripmaster" was a unique optional feature available midyear during the 1978 and also the 1979 model years at a cost of US$920. This option replaced the two standard analogue gauges with an electronic digital readout for the speedometer and remaining fuel. It also replaced the quartz digital clock with an LED display clock. The trip computer also included numerous calculations at the touch of a button on a small panel located to the right of the steering wheel. These included miles to empty, miles per gallon, and a destination arrival time (which needed to be programmed by the driver, to estimate arrival time based on miles remaining). Though preceded by the British 1976 Aston Martin Lagonda sedan, the Seville was the first American automobile to offer full electronic instrumentation. Although the 1978 Continental Mark V was available with a "Miles-To-Empty" feature (i.e., an LED readout of miles left to travel based on the fuel remaining), Lincoln did not offer full electronic instrumentation until 1980. The trip computer proved an unpopular option and was rarely ordered, probably due to its rather high cost. A digital instrument cluster was not available on the Seville and Eldorado again until 1981. Although the "Trip Computer" itself was no longer available, the new electronic fuel data system introduced in 1980, as well as the new electronic heating and air conditioning controls, replaced some of the trip computer functions that were provided previously. A number of custom coach builders made modifications to the 1975–1979 Seville, to include shortened 2-seat 2-door convertibles, a 2-door convertible with a back seat, a 2-door pickup truck, 2-door coupes, 2- and 4-door lengthened-hood Sevilles with a fake spare tire in each front fender, and a lengthened-wheelbase standard 4-door Seville. The Seville was manufactured in Iran under the brand name of "Cadillac Iran" from 1978 to 1987 by Pars Khodro, which was known as "Iran General Motors" before the Islamic Revolution. A total of 2,653 Cadillacs were made in Iran during this period. This made Iran the only country assembling Cadillacs outside the U.S. until 1997 when Cadillac Catera was based on Opel Omega and built in Germany for U.S. market. Cadillac BLS, built in Sweden for European market, but never available in U.S. market, was introduced in 2006. Even though the Cadillac Allante had an Italian-sourced body and interior, its final assembly was done in the U.S.
From 1978, through the third generation in 1988, Seville was available with the Elegante package. For 1978, this package added a unique black/silver two-tone exterior paint combination and "perforated-style" leather seats in light gray only. Real wire wheels were standard as were a host of other features which were optional and/or unavailable on the base Seville. In 1979, a second color combination was added, a two-tone copper shade with a matching leather interior. For the second generation Seville Elegante in 1985, a monotone paint combination became available, however dual-shade combinations, which were now available in various colors, remained more popular. The price for this package increased over time beginning at US$2,600 in 1978 and peaking at US$4,005 in 1987. Overall, the first-generation Seville was quite successful, but not the paradigm-changing boost GM had hoped for. Buyers were turned off by its having a higher price tag than the standard models (which rose rapidly each year during the inflation-plagued late '70s). It also failed to attract the younger import-buying audience, especially since luxury makes tended to sell based on brand loyalty rather than price or features. One rather embarrassing study of Seville buyers discovered that they were popular with senior citizens who wanted a Cadillac in a smaller, more maneuverable package. While the first-generation Seville had proved quite successful, it failed in its primary mission of winning over younger import buyers. Marketing research indicated that the car was most popular with older women who wanted a Cadillac in a smaller, more maneuverable size. For the 1980 model year, the Seville's K-body platform became front-wheel drive, based on the E-body of the Eldorado, Buick Riviera and Oldsmobile Toronado. Length and wheelbase were similar, with the car losing .3" in wheelbase and gaining .8" overall. The new model featured independent rear suspension and was the first American car to have a standard diesel engine, which had carried over from the previous generation. Cadillac's new 368 cu in (6.0 L) L62 V8 with Digital Fuel Injection was a no-cost option except in California, where the fuel-injected Oldsmobile 350 remained available, also as a no-cost option. The razor-edged bustle-back rear styling drew inspiration from English coachbuilder's Hooper & Co. "Empress Line" designs from the early 1950s; themselves a dramatic, modernized take on the mid-'30s style of trunk/body integration. In addition, long hood/short deck proportions were in the later half of a revival that had manifested on large, exclusive luxury cars from the 1960s onwards, as in halo personal luxury cars such as the Buick Riviera, Oldsmobile Toronado, and reconfigured Cadillac Eldorado. The Seville's "statement" styling was one of the last vehicles designed by GM's Bill Mitchell, appointed by Harley Earl in 1936 as the Chief Designer in the then newly created Cadillac design studio, was swiftly imitated by the 1982–1987 Lincoln Continental sedan, and the 1981–1983 Imperial coupe. Sales were strong at first, but disastrous flirtation with diesel engines and the ill-fated V-8-6-4 variable displacement gasoline engine, coupled with poor quality control, began to erode Seville's standing in the marketplace. The Seville initiated features that would become more traditional in later years. In 1981, "memory seats" — a feature not seen on a Cadillac since the Eldorado Broughams of the late 1950s — became available again. This option allowed two memorized positions to be recalled at the touch of a button. Also new for 1981 was a digital instrument cluster. The "Cadillac Trip Computer" was a precursor to this option in 1978. For the 1981–1985 Seville and Eldorado, it was considerably less expensive at US$200 in 1981 and did not contain the many features of Trip Computer, just a digital speedometer and fuel gauge. Engine options changed for 1981; the Cadillac V8 was now equipped with the V8-6-4 variable displacement technology. However, the engine management systems of the time proved too slow to run the system reliably. A 4.1 L (252 cu in) Buick V6 was added as a credit option. "Puncture-sealing" tires were also new for 1981. In 1982, Seville offered heated outside rear-view mirrors with the rear defogger option. Inside, a "Symphony Sound" stereo cassette tape system was available. The previously standard diesel engine became an option, as Cadillac's new 4.1 L (250 cu in) HT-4100 was introduced. This engine, especially in its early years, had a number of reliability issues, such as weak, porous aluminum block castings and failure-prone intake manifold gaskets. For 1983, the Buick V6 was dropped and a new "Delco/Bose" stereo cassette system was offered at US$895. Initially, looking like a standard Delco radio in 1983, from 1984 on it featured a brushed gold-look front panel and bulbous lower interior door speaker assemblies. This was also the last year for the availability of an 8-track stereo system for Seville. On the outside, from 1983 through 1985, Seville was available with a "Full Cabriolet Roof" option, which gave Seville the look of a four-door convertible. In 1986, an all-new, much smaller body attempted to combine the crisp angularity of the original Seville with the rounded edges of the new aerodynamic aesthetic. The series featured a transverse-mounted V8 driving the front wheels. The result was: the smaller size and nontraditional styling were regarded by some traditional Cadillac customers as being too similar to secondary cars produced by other GM divisions and customers stayed away. The new Seville also came with a 15% price increase over the 1985 model. This model was considered a disaster, and an exterior refresh was rushed for 1988. The new Seville/Eldorado chassis featured an advanced transmission and engine control system that offered EPA fuel consumption figures of nearly 30 mpg‑US (7.8 L/100 km; 36 mpg‑imp) on the highway using a small fuel injected V8. The new model featured a worldwide production car first—a computer system that monitored the car's systems and the engine. The BCM/ECM (Body Control Module/Engine Control Module) was paired with an electronic dashboard using high intensity vacuum fluorescent displays and utilized GM's expertise derived from the acquisition of Hughes Electronics, makers of communications and spy satellites. With sales way below expectations, an exterior refresh was rushed for 1987 as a 1988 model. This was the final Cadillac Seville generation to have annual facelifts for the grilles. The big news for 1988 was the introduction of the Seville Touring Sedan (STS) which came equipped with GM's FE2 Touring Suspension. It featured special 15 inch alloy wheels, special springs, rear sway bar, and a special 15.6:1 steering ratio for enhanced handling, a grille mounted Cadillac emblem, special cloisonne trunk lock cover, and a unique four-place interior. 1988 Seville Touring Sedan production totaled 1,499 units. The first 1988 STS's were custom built in June 1988 by Cars and Concepts and announced at the 1988 Detroit Grand Prix. These initial run models were available to VIP's within General Motors, the Cadillac Division, some major shareholders and a short list of dignitaries. A special label was affixed to the lower corner of the driver-side front door by Cars and Concepts identifying it as one of the original STS's. For 1989, the first "regular production" STS's were sold as a "Limited Edition" with an option code of YP6. Features from the 1988 model were carried over to the 1989 production model year with the addition of a retuned European-feel suspension package for more precise steering control and firmer feel of the road. The features of the STS over the standard Seville included hand-stitched beechwood ultrasoft leather seats, anti-lock braking, touring suspension, a 3.3:1 drive ratio; 15-inch cast aluminum alloy wheels and Goodyear Eagle GT4 blackwall tires. The additional STS features were: grille with flush-mounted wreath-and-crest, modified driver's front fender with the cornering light moved to the front fascia and headlight monitors removed, matching body color front lower airdam and bodyside moldings, matte black export license pocket with bright bead, matte black front bumper impact pads and rear bumper guard vertical inserts, matching body color outside rearview mirrors with black patch, modified (from Eldorado) rear reflexes (moved to the bumper), modified export taillamps with three-color European-style lenses, STS nameplate on the decklid and an STS exclusive cloisonne deck lid lock cover. The STS interior had a 12-way power front seat, manual articulating front seat headrests, center front armrest with cassette and coin/cup storage console trimmed in ultrasoft leather, net-type map pockets, rear bucket seats with integral headrests, center rear console and rear storage compartment, leather-wrapped front and rear door trim panels, door pull straps and overhead pull straps, high-gloss elm burl real wood appliques on door trim panels and switch plates, horn pad and bar, instrument panel and front and rear consoles, Beechwood Thaxton floor carpet and a decklid liner in tara material with STS logo. Other standard STS features (these were options on the standard Seville) were: automatic door locks, illuminated driver and passenger side visor vanity mirrors, illuminated entry system, rear window defogger, theft-deterrent system and trunk mat. Only 4 exterior colors were available for the STS this year: White Diamond; Sable Black; Black Sapphire; or Carmine Red. 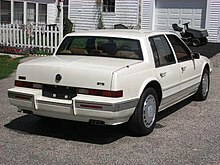 1,893 Seville Touring Sedans (STS) were produced for the 1989 model year. The first 1989 STS's were leftovers from the Cars & Concepts run of the 1988 production year and had the special sticker located on the lower part on the inside of the driver's door. These were produced prior to December 1988 for the 1989 production year and are very rare. The last 6 digits of these VIN numbers would be below 808000. As with the 1988 model, a special 3.25" x 2" black/silver chrome label was affixed to the lower inside area of the driver-side front door by Cars and Concepts identifying it as one of the original STS's. In 1990, the Seville got a new fuel injection system which brought the horsepower up to 180. Front park lamps were no longer mounted in the fender on any models, and the Seville STS underwent some major changes. These included new side and rear body color fascias which gave the car a sportier, more aggressive look. Also added was dual exhaust with bright stainless outlets, a larger STS trunk script, standard Teves anti-lock braking system with rear discs, and 16-inch machine finished alloy wheels on Goodyear Eagle GT+4 tires. A driver's side airbag was also added to Seville and STS. While the engine was the same as used in regular Seville models, the transmission had a special final drive ratio of 3:33:1 for better acceleration. The 1990 STS also received its own body designation of 6KY69, and prices started at $36,320. 1990 STS limited production totaled 2,811 vehicles. There were no body changes in 1991, but mechanically there was a new 4.9 liter V8 under the hood coupled to a 4T60E electronically controlled transmission. The new V8 no longer used the A.I.R. system, and additional refinements to the internals brought the horsepower up to 200. The only change to the STS was the removal of the rear bucket seats for a full-width bench, and new front seats with larger side bolsters taken from last years Eldorado Touring Coupe. 2,206 were produced. For 1992, Cadillac delivered a new, European-flavored Seville with positive reviews as well as customers. The Seville Touring Sedan was Motor Trend magazine's Car of the Year for 1992. It also made Car and Driver magazine's Ten Best list that year. The Seville STS adopted styling cues from the 1988 Cadillac Voyage concept car. 0–60 mph times were 7.4 seconds for the SLS and 6.9 seconds for the STS. Rain sensing wipers, called RainSense, were standard on the STS. Base prices for both models peaked in 1996 at US$42,995 ($70,694 in current dollars) for the SLS and US$47,495 ($78,093 in current dollars) for the STS but the increasingly competitive luxury car market resulted in price reductions for 1997. In 1997, the Cadillac Catera took over from the Seville as Cadillac's smallest car. The Seville was updated for 1998, and was now built on GM's G platform; however GM chose to continue to refer to it as the K platform. It was the first Cadillac launched with a European type approval number in Europe such as United Kingdom first, and then Germany, Belgium, France, Spain, Italy, Finland and other in markets. All transverse engine front-wheel drive Sevilles were built in Hamtramck, Michigan. The wheelbase was extended to 112.2 in (2,850 mm) but the overall length was down slightly to 201 in (5,100 mm). The car looked similar to the fourth-generation model, but featured numerous suspension and drivability improvements. The Seville STS (and companion Eldorado ETC) became the most powerful front-wheel-drive cars on the market at 300 hp (224 kW). The top STS model runs 0–60 mph in just 6.4 seconds and has a 14.8 second quarter-mile time. The fifth generation Seville was the first Cadillac engineered to be built in both left- and right-hand-drive form; becoming the first modern Cadillac to be officially imported and sold in South Africa along with other right-hand-drive markets such as Japan and the United Kingdom. In the past, right-hand-drive Cadillacs were built from CKD kits or special conversion kits shipped for local conversion. In addition, this Seville had two lengths: one for US market and one for export market, namely Europe. The export version had thinner bumpers as to bring the overall length under five metres since some countries place higher taxation for passenger cars longer than five metres. In January 2002, Seville STS received a new MagneRide adaptive suspension system. Though the new MagneRide system was standard on Seville STS models, it was not available for Seville SLS models. Production of the Seville STS ended on May 16, 2003. Seville SLS production ended seven months later on December 4, 2003. In 2004, only the Seville SLS model was available for purchase. The Seville model name was discontinued for 2005 and replaced with the Cadillac STS. ^ Witzenburg, Gary (April 1984). "The Name Game". Motor Trend: 85. ^ "Design Notes: 1975 Cadillac Seville » Page: 4". Autos of Interest. 2012-05-22. Retrieved 2017-07-07. ^ "Pars Khodro in history". Pars Khodro. ^ "Design Notes: 1975 Cadillac Seville » Page: 5". Autos of Interest. 2012-05-22. Retrieved 2017-07-07. ^ "Design Notes: 1975 Cadillac Seville » Page: 6". Autos of Interest. 2012-05-22. Retrieved 2017-07-07. ^ March 2008 issue of Collectible Automobile detailing the 1977 GM full-size cars. ^ "Cadillac Seville Milan Roadster Convertible - Home". Milanroadster.weebly.com. 2010-05-06. Retrieved 2017-07-07. ^ General Motors Design Impact 1977, p. 1. ^ "1988 Cadillac Voyage Concept". Supercars.net. Retrieved 2015-01-19. ^ a b Frame, Phil (16 January 1995). "GM H CARS MOVE TO G PLATFORM". Automotive News. Archived from the original on 17 May 2013. Retrieved 17 May 2013. ^ a b "Cadillac 0–60 Times & Cadillac Quarter Mile Times". Zeroto60times.com. Retrieved 2016-05-01. Wikimedia Commons has media related to Cadillac Seville. This page was last edited on 7 April 2019, at 18:22 (UTC).